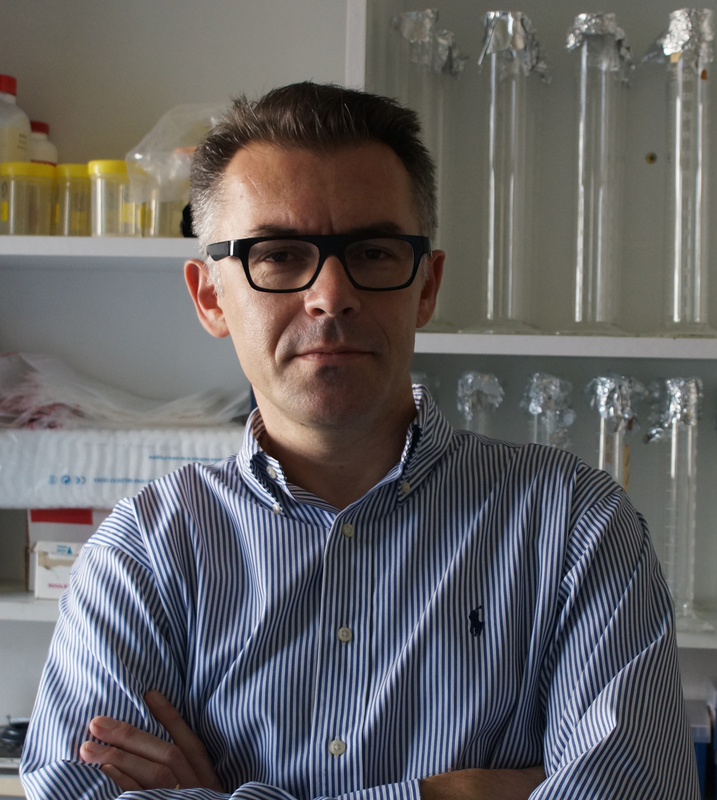 Jacques Pantel and his collaborators work on the functional consequences of modulating G protein-coupled receptors (GPCRs) using genetic or drug discovery approaches. Their field of interest currently focuses on centrally expressed GPCR drug targets involved in body weight control. Key words : G protein-coupled receptors, drug discovery, mutation, GHSR, eating disorders. The hormone ghrelin, initially discovered for its growth hormone secretagogue properties and popularized for its actions on food intake, adiposity and glucose metabolism is now considered as a pleiotropic hormone. However, the delineation of the physiological role of this hormone or its receptor the Growth Hormone Secretagogue Receptor (GHSR) using conventional knockout models was complicated by several factors such as the compound regulation of the active form of ghrelin or the complex signaling properties of the GHSR, a G-protein coupled receptor (GPCR) documented with ghrelin-dependent responses and also ghrelin-independent responses. From previous work we were the first to disclose the role of the GHSR gene in the physiology of somatic growth in humans. These results obtained using human molecular genetics were confirmed later by several groups exploring common genetic variants in this gene. In a paper released in the April 19th issue of Science Signaling, we now propose that the gain of weight due to ghrelin is a consequence of increased fat storage without promoting appetite. 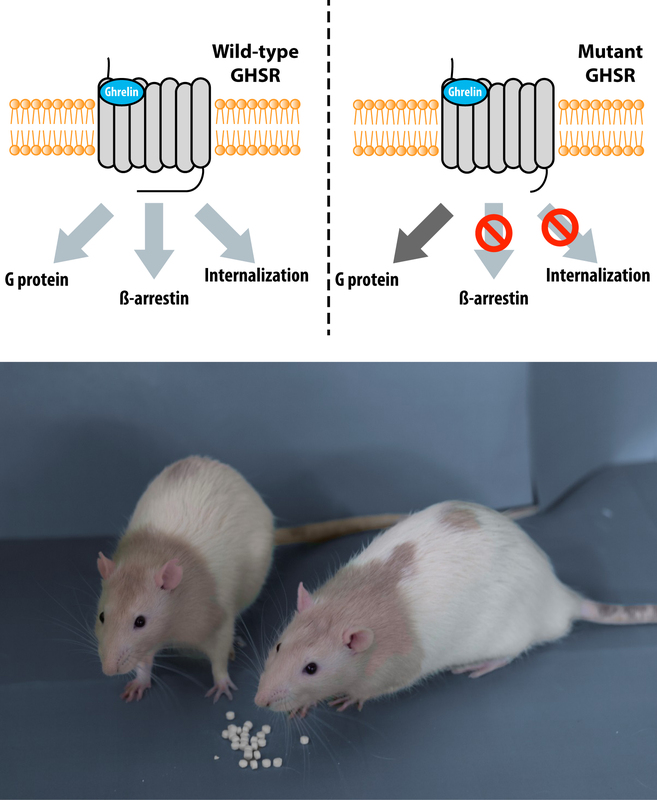 In this study, we examined a mutation of GHSR in rats and found that these animals were more sensitive to ghrelin and gained more body weight as fat without eating more food than their wild-type littermates. The mutation produces a truncated form of GHSR lacking part of the C-terminus, which was internalized to a lesser extent and recruited less β-arrestin, processes that terminate signaling through GHSR. Cells with the truncated GHSR had enhanced responses to ghrelin compared to those with full-length GHSR, suggesting that the C-terminus decreased the sensitivity of GHSR to ghrelin. Thus, ghrelin promotes fat storage without affecting appetite. Besides, these rats with the mutant GHSR are a useful model for testing anti-obesity treatments. 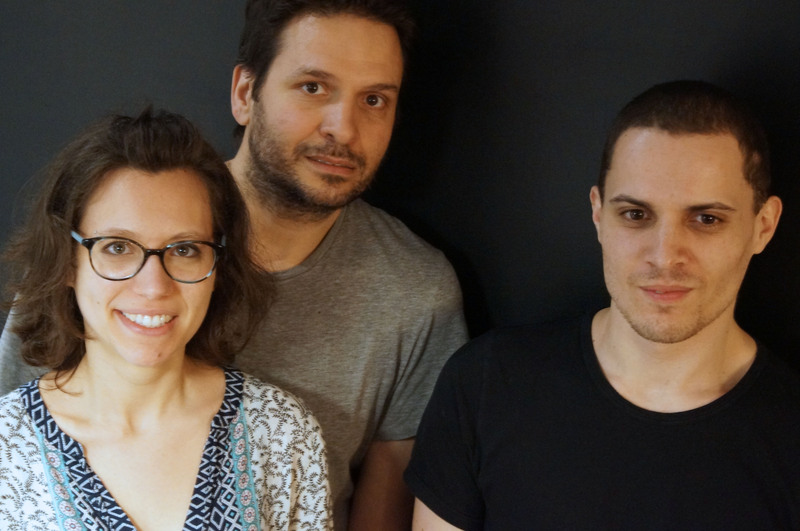 The Centre de Psychiatrie & Neurosciences team that coauthored the research article released in Science Signaling includes, from left, Candice Marion, Philippe Zizzari and Yacine Chebani. Abstract, reprint pdf or html version. Identification of allosteric modulators of the melanocortin-4 receptor (MC4R) by high throughput screening and genetics of anorexia nervosa in collaboration with the Cone lab at Vanderbilt University.